We are the best hair vendor online. Having been in this area for years, New Star Hair could offer you the highest quality remy hair products. This Peruvian deep curly weave uses 100% real natural virgin hair originated from Peruvia. All hair products on our site are true to length, the wefts are well constructed. The curls pattern on this extension is amazing and could keep for a long time. 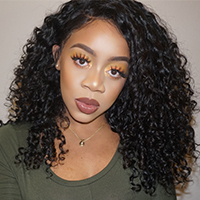 Peruvian hair is soft yet thick, each hair strand is a perfect blend of natural hair, wearing this deep curly weave is easy for you to make any hair style. We have natural black to medium brown color for you, when the hair is wet, it shrinks into a tight curl, the hair will slowly loosens up when it is dry. Because the same as human natural hair, our Peruvian hair is strong and could withstand regular heat styling. good hair Review by Destiny T.
Love the hair and very satisfied with the price. The curls are good and hair looked very natural. Thanks. Hair is good quality and took about 3 days to arrive. Have not installed yet but from the look of the bundles, they are good for the price.